Calvin and Hobbes means the world to me. I started reading it as a 9-year-old and followed it religiously until it ended ten years later. I used to actually cut out strips as they appeared in the paper and paste them into photo albums -- many photo albums -- until my mom got tired of me stealing all her albums and started buying me the collections. My most prized books today are my three-volume collection of the entire run of strips. I must read through the whole set once a year. So much of who I am today has been informed by the wit, imagination, wonder, art, and, yes, the values of Mr. Bill Watterson. The irony of choosing Calvin and Hobbes for this week's Twart is that I probably could have done a better job of it when I was 12. Back then I used to fill sheafs of looseleaf with Calvin doodles. Now, though, it's probably been 15 years since I last drew these characters, and it shows. In places, I think I'm within a cannonshot of being on model, but only in places. I'd like to sound cool and say this is because I just didn't have time to do it right, but, honestly, I spent all damn day on this thing! But whatever. The point is not to show that I'm awesome (I'm clearly not). The point is to remind you how awesome these characters and their stories are, and to maybe inspire you to go back and spend a little more time with them. i sympathize with you when you wrote this took you all day to draw because you haven't drawn C&H since you were 9. i am exactly the same with the characters i drew when i was a kid, most of which where anime characters! this is really cool and inspiring. great job! Mister Fairbairn, it is always a joy to read your posts. Thank you for sharing. 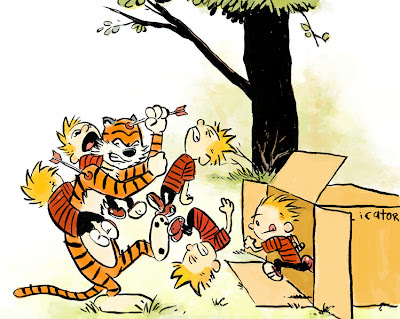 And if you are only within cannonshot of being on model my recollection of the look and composition of Calvin and Hobbes is way off, and I do not think it is. This is wonderful in "model" as well as composition--Right On. Thank you for choosing this and for sharing the why behind it all as well. I'm glad to hear someone else cut out strips from the newspaper and housed them in photo albums; all these years, I kind of worried I was the only one. Mike -- Thanks, sir! The Collected Works of Bill Watterson is my desert island book. I love every strip to death. Phil -- haha. That's great! I though -I- was the only one who did that! Frigging love this, man. The duplicator gags were some of my favourite strips to read when I was a kid. Actually, they all are my favourite but this one could be one of the most. Most favourite. Wonderful show of appreciation and love. Not just your drawing, all those below, too. It's good to remind people just how great C&H was. IS! Thanks, I'll pry one of my old collections from the shelf tonight.